THE HAPPY HYDRO PROMISE: If you’re not happy with your purchase we will give you a 100% refund, no questions asked. So, go and get some new gear! If you’ve been using regular scissors to trim, shape or prune then it’s time for you to say goodbye to aching wrists, hands and blisters! 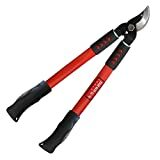 Now you can accomplish the task effortlessly with this premium Gardening Scissor. 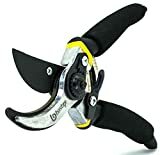 Its’ razor sharp stainless steel blades curves to an ultra-fine point for even the most delicate pruning tasks. Reduce strain while increasing your comfort. A built-in safety lock keeps these super sharp blades securely closed until you’re ready to open them. Then, the gentle spring action lets you smoothly open and close the blades, snip after snip, reducing the strain on your hands and wrists. A rubberized grip adds to your overall comfort while using this lightweight, precision-honed gardening tool. Weed out all of those dull, uncomfortable pruners and snips from your shed. Add our ultra-sharp Gardening Scissors to your cart today.